The Elite still has the hot hand when it comes to moving tickets. A ticket pre-sale was held on Monday for All Elite Wrestling‘s first show, Double or Nothing. It did not take long for those tickets to sell out. Some fans reported long delays in the “waiting room” at AXS.com, where tickets were sold. AEW took steps to make sure fans got the tickets instead of scalpers, but ringside seats (face value: $211) are already on the secondary market for thousands of dollars. If you were hoping to score Double or Nothing tickets but were shut out on Monday, the general public onsale goes down this Wednesday (2/13) at 9am PST/ 12pm EST. Nick and Matt Jackson of the Young Bucks joked that after this latest, they might have to consider holding shows in a larger venue. 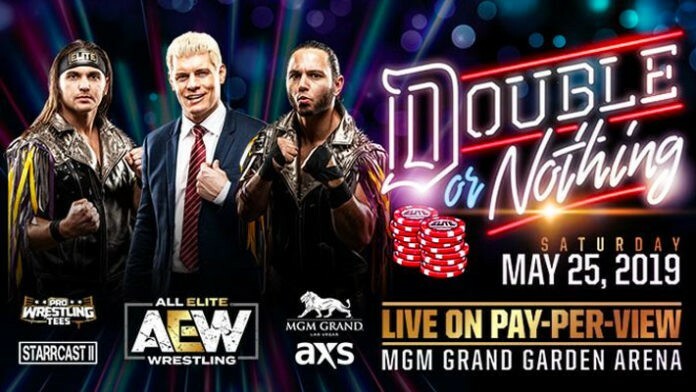 AEW Double or Nothing takes place on Saturday, May 25th from Las Vegas, Nevada at the MGM Grand Garden Arena.